Carter visited Cuba previously in 2002, the first and only U.S. president to visit Cuba since the 1959 revolution. 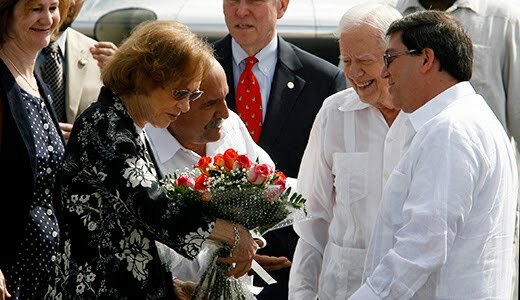 According to the Cuban press, the visit "was a demonstration of his interest in better bilateral relations..."
The party congress is one of the main reasons for Carter's visit. According to the Carter Center, he and former first lady Rosalynn Carter traveled to Cuba to "meet with President Raúl Castro and other Cuban officials and citizens to learn about new economic policies and the upcoming party congress, and to discuss ways to improve U.S.-Cuba relations..."
While Carter's trip is technically a private venture, sponsored by his organization, analysts say some sort of policy announcement, either from the Cuban side, the U.S. or both, is possible. I take it by Second Worst President, the unnamed First Worst President would be the current one...Good play on words Trevor...Unless of course you meant Woodrow Wilson...lol I'm betting on the current one. He looks like a patient in a mental ward. Carter needs to have his passport revoked and be forbiddden to leave the country; he's not only more of an embarrassment to the USA now than he was as president, if possible, but his constant sojourns into unstable, hostile environments places him, and thereby the United States at risk.